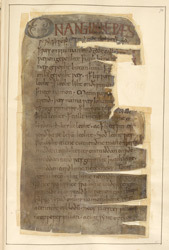 The Anglo-Saxons began making translations of books of the Bible by the mid-8th century by writing glosses or translating single words and phrases between the lines of Latin psalters and gospel books. After Alfred the Great's programmes to elevate learning and literacy in his kingdom, Old English translations, without the Latin, were no longer unusual. Translations of the gospels appear to have been fairly numerous in the 10th and 11th centuries to judge by the number of surviving copies. This gospel book in Old English probably belonged to Malmesbury and could have been made there because it is in a West Saxon dialect. It is lucky to survive at all, having been severely damaged in a fire which burnt the huge collection of medieval manuscripts which Robert Cotton, had left to the nation in the 18th century. This page comes from the Gospel of John.